Summary: A new play about a community dealing with the closing of a steel plant in Reading, Pennsylvania in 2000. 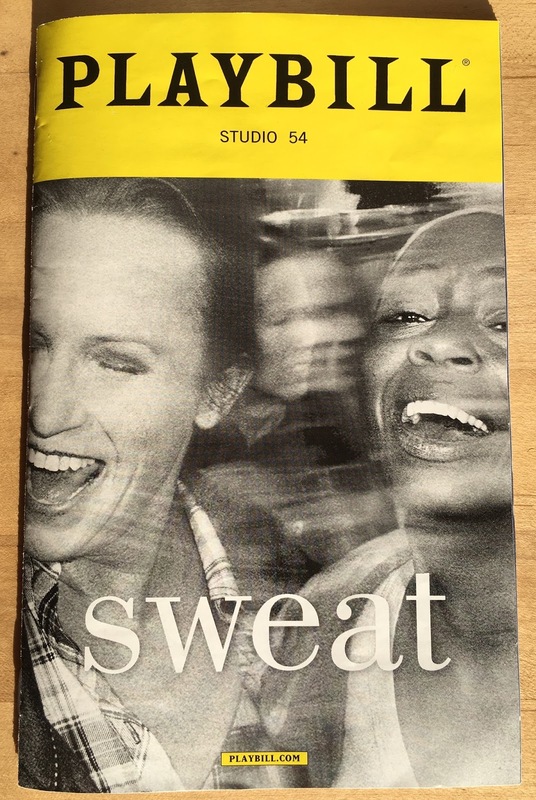 Highlights: Pulitzer Prize winning playwright Lynn Nottage is making her Broadway debut with Sweat, now in previews and officially opening on March 26. I've seen and loved a couple of her plays, Intimate Apparel (which I saw at the Guthrie years ago, and look forward to seeing Ten Thousand Things' production this spring, especially since visiting the Lower East Side Tenement Museum which I highly recommend if you're in NYC) and By the Way, Meet Vera Stark at Penumbra. For this play, she and frequent collaborator, director Kate Whorisky, visited Reading and interviewed people affected by the closing of the steel plants. The result is this brutal look at friendship, family, loyalty, and the devastating effects of a sudden turn in the global or local economy. All of the characters and their relationships feel complicated and real, beautifully and painfully brought to life by this excellent nine-person cast (which this TV nerd has to point out includes Alison Wright, aka Martha from The Americans). Most of the action takes place in the local bar (a very detailed and realistic rotating set designed by John Lee Beatty) as this group of friends celebrates, commiserates, and eventually fractures. We see the longer term effects of the plant closing in 2008, then flash back to how it all came about in 2000 (with the passage of time that year nicely marked by the sporting events on the bar's TV). Sweat is a tough one to watch and pretty depressing, but provides a realistic look at some of the troubles in the world today.